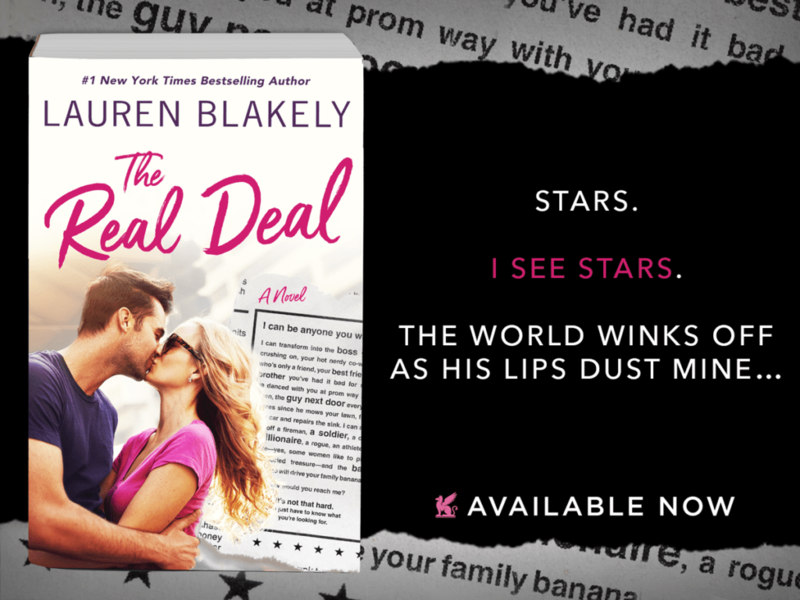 What do you get when you mix a bad boy with a heart of gold and a smart & sassy heroine with a desperate need for a fake relationship? 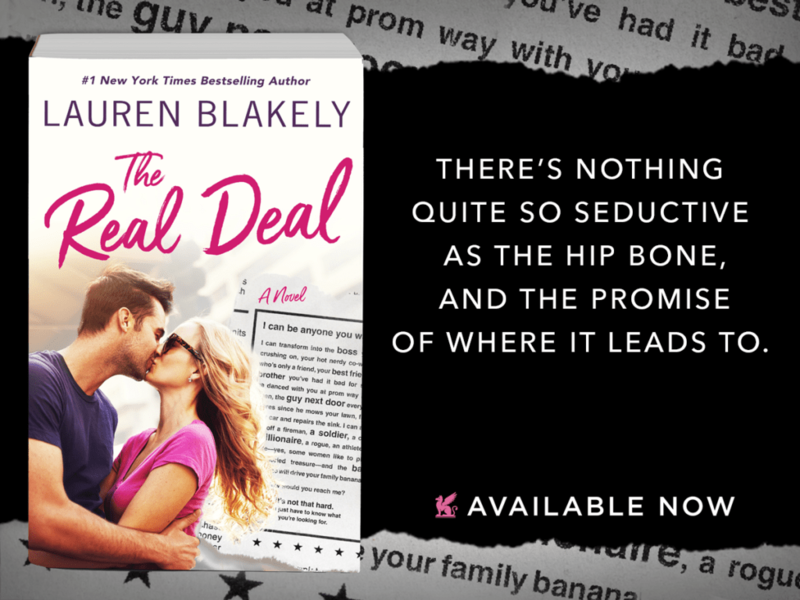 THE REAL DEAL, a brand new, standalone romantic comedy from #1 New York Times bestseller Lauren Blakely! 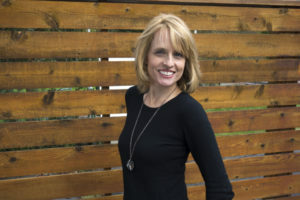 Get a copy of your next favorite feel good rom-com now! 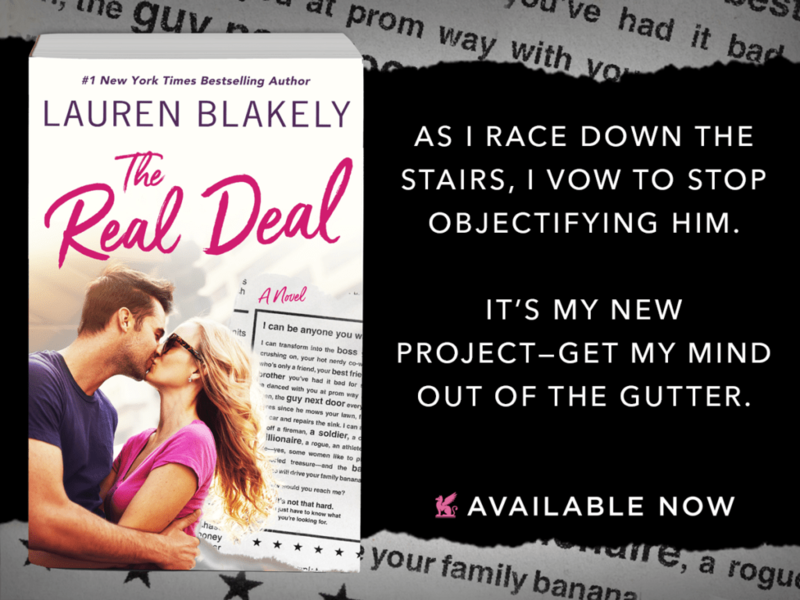 Romance readers are quite familiar with the ‘pretend boyfriend’ or ‘boyfriend-for-hire’ trope, so the fact that April Hamilton and Theo Banks meet one another through a ‘Gigs for Hire’ personal ad because April wants her overbearing family to stop hounding her about her personal life is a predictable storyline, but Lauren Blakely brings freshness to a commonly used story line by infusing it with comical character interactions, a palpable attraction between the hero and heroine, and a first person perspective that provides April and Theo’s internal musings and diatribes as they start a connection based on a paid transaction and slowly moves to something they never anticipated but perhaps sorely needed. Theo is definitely more of a mystery than April is, and as the story progresses and Theo’s past is carefully revealed, his hesitancy makes sense…his need to payoff his debt and all that that process entails is understandable, and while April’s reaction to the man Theo used to be is concerning, not showing April exactly who Theo was and is will only make things that are developing between them hit a roadblock that they might not be able to overcome. April’s family adds so much hilarity and dramatics to April and Theo’s story because due to her relatives meddling, April and Theo find themselves in some rather precarious positions throughout all the family fun that’s had and the close quarters that are forced upon them as they begin to get to know one another and find that their attachment to each other is stronger than they could have ever imagined. Imagine the squirrelest and craziest bunch of relatives that someone could have and that’s April’s crew. But, the fact that they are all up in April and Theo’s lives and pull some crazy antics does provide a bit of comic relief when things get too tense or overwhelming for what’s developing between April and Theo, so this interesting bunch of people help to balance the stress and sexual tension that seems to surround this ‘pretend’/‘real’ couple. 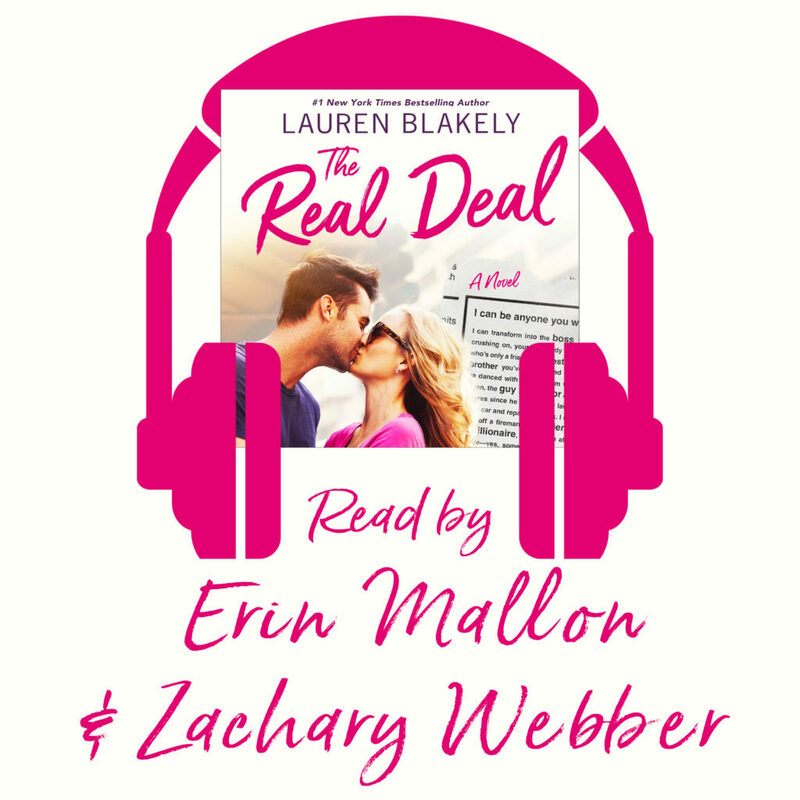 The Real Deal is another fantastic romantic comedy from the hilarious and gifted mind of Lauren Blakely, but there’s also quite a bit of angst mixed in with the entertaining scenes, adding depth to the plot and allowing it to take an unpredictable course, which keeps readers’ interest until the very last page of April and Theo’s book. Everything you need for Date Night except the date:). 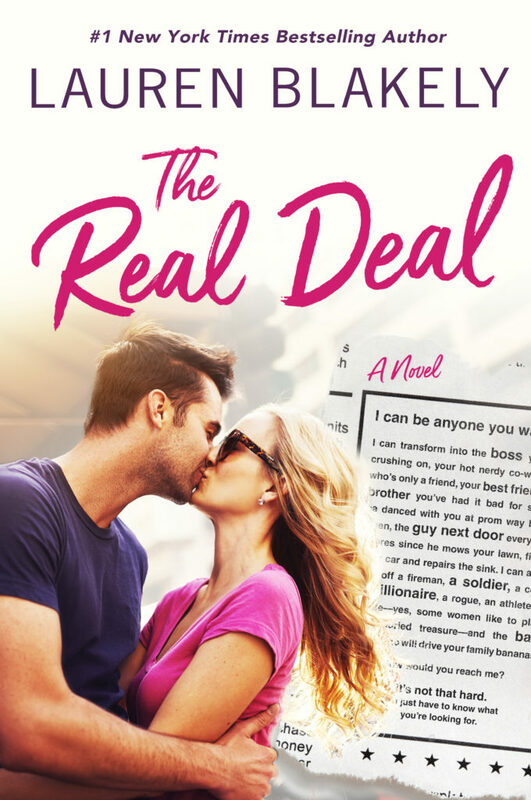 Find the perfect date in the Real Deal!